If you’re looking for creative April social media ideas then you’ve found it. This post is packed with Social Media Holidays for April, with plenty of social video ideas, GIFs and more! If your content calendar is in a bit of a slump then this post will help you to find April social media ideas for video, GIFs and more. We’ve rounded up national, international, popular and weird and wacky days of celebration. There are literally 60+ ideas. Dozens of ways to get creative with your content. We’ve also included daily, weekly and monthly April social media ideas to suit however you like to run your content. And, as always, we’ve listed tools and ideas you can return to at any time for later reference! What’s Included With Our April Social Media Ideas? a handy quick-reference guide to social media holidays for April. We’ve added the main holidays to a handy infographic! Please feel free to share this with your friends so they can find their way back to this article! an overview of April social media ideas – including how you can create and share them. We have focused on on ideas for social video but you can also use them for any type of static images too! a list of tools and resources that can help you with your April social media ideas for content creation! It can be tough to create content month after month. It takes time! If you schedule ahead and follow these simple tips, it’s soooo much easier. In fact, if you follow a few key strategies we’ve outlined below you’ll have a month’s worth of content created and scheduled out, ready to go. And the best part is that it doesn’t have to take hours and hours! Use a template. There are plenty of templates available on the tools I’ve recommended below. Use one of them and use it to guide you. Why spend ages creating a cool design, when you are not a designer? Instead, use a design that a designer has already signed off on, and edit the template. Edit just the text or photo or colors. Don’t go too crazy as then you run the risk fo ruining the design (sorry, but it’s true and that goes for me too!). Create in batches. If you are going to get into a creative space that results in you creating one social video (this applies to images too), why not create two videos? or three videos? or 10-20 images? It’s much easier to create a bunch of videos in one sitting than to do them all at separate times. You have the tools open and ready to go. Keep going and do another one! Create some short videos for social media posts – We’re talking short videos of 15-30 seconds vs long form content. If you’re looking for more advice about how to create effective 15 second videos, check out this blog post. Create content that’s easily consumed. This includes quotes, tips or observational humour. All of these are great for engagement, especially on Facebook where people scroll through content at a rapid pace. Create GIFs to add personality to your posts. Whether creating your own GIFs (I’ve added tips below) or posting one of the millions of GIFs in the Giphy library, adding a GIF to your posts brings a lot of character and humor. You can also add them into emails or blog posts! Save it to Pinterest to refer to later! Want to see the full 2019 Social Media Holiday Infographic? Click here. Create a social video about the holiday in question – You can do a Top 5 list, create a how-to video, show behind the scenes of your business (related to the holiday in question), make a tutorial, or a smple quote video. It’s time to get creative! Is it Pizza Day? Do a video about Pizza Fun Facts! Use a video tool like Wave to help you. Create an image based around the holiday – a quote, meme, saying, tip, photo that reflects the celebration day or image with text overlay. In this post we focus mainly on social video, GIFs and animated visuals, but you can use all of this information to create some awesome images too. You’re only limited by the extent of your imagination! We’ve also included more tools and tips at the end of the post for creating April content. Let’s dive in! We’ve included at least one event for every day in our April list of social media ideas and holidays. There’s also hashtags, tools, tips and resources for creating visual content throughout the year. This post will be updated annually to check dates, and we’ll add content as we find or create it. So keep these posts bookmarked to refer back to! 2. International Children’s Book Day – Held on Hans Christian Andersen’s birthday, the 2nd April, a day of celebration around children’s literature and the love of reading. Find out more here. It’s also World Autism Day – As a former Speech-Language Therapist, I support anything that celebrates and support the amazing humans in our world who have autism. World Autism Awareness Day is held on the 3rd April. Use the hashtag #WAAD or #WorldAutismDay and find out more here. 5. Go For Broke Day – Today is a day for taking risks and facing your fears! #GoForBrokeDay. The 5th of April is also Caramel Day, so go for broke and face your fears while eating something caramel-icious. Or while eatingDeep Dish Pizza. It’s Deep Dish Pizza Day too. Thanks to Pizzeria Uno’s founder Ike Sewellwho created the Deep Dish in Chicago in 1943. Today is also world Caramel Popcorn Day and Pillow Fight Day! 7. World Health Day – The World Health Organisations official day to celebrate and promote health around the world and ensuring that everyone can obtain the health care they need, wherever they live. Find out more here. 9. Unicorn Day – A special Unicorn deserves a special day. Have fun with this one – whether it’s talking about “Unicorn” businesses to fantastical creatures. #UnicornDay. And if you’re looking for an excuse to post a powerful quote, it’s also Winston Churchill Day. It’s also Encourage a Young Writer Day if you have some content around writing and literature to share as part of your April Social Media Ideas. 14. Dolphin Day – a day to celebrate as well as protect dolphins. #DolphinDay is celebrated around the world as an unofficial holiday around our human-like friends of the sea. 15. World Art Day – Today is #WorldArtDay – Find out more here. 19. Good Friday – a popular international holiday the world round. Today is #GoodFriday. 20. Look-a-like-Day – a great day to talk about about twins, cloning, copycats, and who looks like whol. Here’s a fun video about Dopelgangers! It’s also Chinese Language Day – recognised by the United Nations it seeks to celebrate multilingualism and cultural diversity as well as celebrating Chinese as one of the six official languages of the Organization. 21. Easter Sunday – Easter Sunday is celebrated the world over and is also the day the Easter Bunny does his thing! It’s also National Tea Day in the UK – celebrate with a cuppa! Oh and it’s also Jelly Bean Day. Find out more here. 23. Talk Like Shakespeare Day – Yes, there’s a day for talking like Shakespeare. Find out more here and here. It’s fitting that it is also World Book Day today on the day that Shakespeare died – so we had to include it as one of our April social media ideas. For Australian’s and New Zealanders, this is a special day on the annual calendar – ANZAC Day, a day of remembrance for the Australians and New Zealanders who served and died in any of our wars, conflicts, or peacekeeping operations. Many Australians will attend a Dawn Service marketing the landing at Gallipoli in WWI. It’s also World Penguin Day. Find out more here. 28. Pay it forward day – This day now attracts people from over 100 countries all taking time to show a little kindness in this world and pay it forward. Find out about it here. 30. International Jazz Day – today is a day for celebrating all things Jazz. Find out more here and how to jazz up your events! Need some quick and easy tools for creating video? These will help you to convert your content ideas into videos and GIFs in no time at all! Wave is my go-to video tool for creating easy social videos. I love using their template library (where most of the videos I create in these posts come from), their huge library of photo and video stock images and audio library. I also love that you can easily add moveable text or stickers to your content. There are so many more features to Wave but you can check it out here or read my full review here. Giphy is THE best place to find GIFs online using their GIF library. Go their website and search on the hashtags you are looking for to find great GIFs. Get creative with your hashtag combinations and you’ll find all sorts of cool GIFs from creators and brands too. I also have a branded Giphy Channel for Socially Sorted so some of the GIFs in these Content Calendar Posts are saved into my Giphy Channel for you to share. Hot Tip: You can also search for GIFs from Giphy via Twitter, Instagram Stories and Facebook posts (including GIF stickers from brand channels like mine). If you search #SociallySorted you’ll find some of my GIFs or we will share the links in these posts too. EzGif is one of my favourite GIF Editing Tools. It makes it super easy to create GIFs from images, edit and a lots of different functions. You can also convert GIFs to MP4 format. I use Easil to create most of my GIFs and I love it because I can not only animate text but I can animate images, filters, icons, graphics and more. It’s like a creative pic-n-mix! 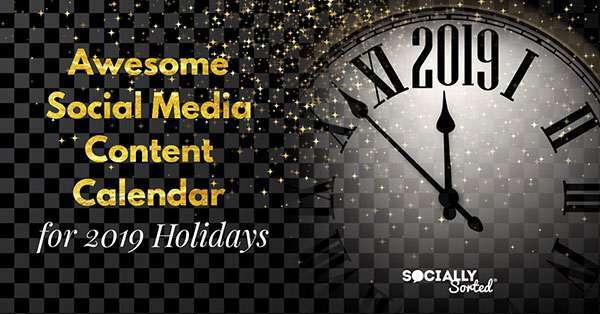 You can see a full list of Social Media Holidays in this post. Do you post on the fly or schedule your content out a few weeks ahead? What are your favourite April Social Media Holidays and have we missed any? Let me know in the comments! The post 60+ April Social Media Ideas – Videos, GIFs and more! appeared first on Socially Sorted. These Facebook Ad Metrics Are Going Away. Are You Prepared?